In recent weeks, I’ve had several people speak to me about the shifting quality of my conversation. Our son, who had been visiting with his family, in a passing comment at the top of the stairs, said, “I love how you talk with people.” I said, “Thank you” and we moved on, but the statement has stayed with me. For years I’ve been interested in how we connect. Or don’t. Now that I’m writing, speaking and teaching about Mindful Conversation, I’m aware of what a difference it is making in my life and so grateful for this gift. For years I spoke from a place of fear. I tried to say what was right. I wanted to fit in and be liked. I worried about how I was coming across. I replayed conversations over and over in my mind. I perseverated – I should have said this or Why didn’t I say that? I wanted to show people how smart I was, or how cool I was, or how well read I was, or how accomplished I was, or … you get the picture. I’m not sure that I know exactly what Mindful Conversation is, but I know what it is not. The above, how I showed up for so many years, is what Mindful Conversation is not. I’m moving, learning, experimenting with a new way of connecting. It’s what I call Mindful Conversation. St. Benedict talked about listening “with the ears of the heart.” That’s as good a definition as I’ve heard. Mindful Conversation is about listening and speaking from, with and to the whole being. When I listen with the ears of my heart, I hear a different voice. I hear what is spoken, and also what is not spoken but implied. I try to listen without judgment, and when I do, I hear more clearly what is coming from my conversational partner rather than what is coming from my own head. It is such a joy. I feel connected to others in a way I never did before. Listening is the heart of it all. I’m learning how to listen. I now listen intentionally at three levels. 1. Level One is the Facts. A lot of conversation happens only at this level. It’s the plot. What happened? Who, what, where, when, why, how many etc? The facts are important, vital. Without agreement on the facts, we can have no dialogue. But the facts are not the full story. 2. Level Two is the Feelings. More than feelings. It’s about thoughts and feelings, assumptions and beliefs, judgments and noble truths that we all hold, but often don’t recognize. Sometimes these are spoken. Often they are not. But they are there, hovering in the room, like a storm front about to hit land. They can change everything. I always keep one of my antennae tuned to level two. 3. Level Three is the Personal Meaning. It’s the so what level. What’s the significance for me level. It’s the level at which we question our identity or our fundamental worth or value. It’s the “Who am I?” question. It’s most often unspoken, and not always at play. But when you’re talking about what’s important to someone, level three is often the unspoken elephant in the room. Each of us has our own, unique conversational style, or conversational personality. I’ve been analyzing different styles and what they say about us. I’ve developed a model for thinking about the range of styles, and a survey designed to help you assess your own style, and it’s strengths and limitations. 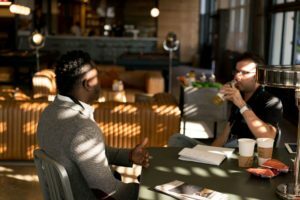 The model and survey are awareness building tools that I hope can help others to engage in the “conversation about conversation.” It’s a fascinating conversation to have, beause how we talk affects how we connect. How we are seen. How we are treated. How we make friends (and lose them). How we love (or don’t). How we work … in short, how we live. If you’d like to participate in the survey and receive a customized report back on your personal conversational style, please visit my web site http://www.petergibb.org. The survey will take you 10 – 15 minutes. It’s free (I know), fun (I hope) and informative (I’ve been told.) Give it a try. I’d love to hear your response. « Staying positive in hard times.